Origin’s Doors combine a stylish finish with the latest in high performance technology to protect your home. Manufactured and assembled exclusively in our UK based factory, our unique 8 point locking system conforms to all the latest security standards. The doors feature chamfered 20mm linear bolts which provide smooth operation when engaging the lock. The locking system features linear bolts, combined with deep throw 25mm security hooks and strong hinges, to give maximum compression to ensure the doors are as secure and weather resistant as possible. it's as swift, smooth and simple as that. A gentle push is all it takes to create your new living space. The secret lies beneath each lightweight frame section where our unique free - glide roller system makes opening and closing Origin Bi-fold Doors an effortless and satisfying experience. Make a statement, or simply match the surroundings of your home. Contemporary or traditional. Whether your taste runs to the subtle or the outrageous, we've created a colour palette to satisfy even the most discerning of tastes. Origin Bi-fold Doors are coated with an ultra-durable polyester powder manufactured by Interpon, the world leader. With all this choice and the scope to have doors with different colours inside and out, your options are virtually limitless. Origin Bi-fold handles just do it so much better. 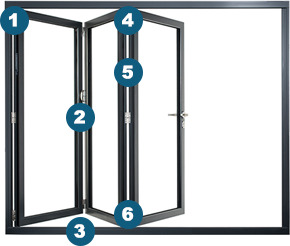 The handles of your Origin Bi-fold Doors are its primary point of human contact. They must blend reliable functionality with tasteful aesthetics and real-world ergonomics. When you hold them, they must communicate safety and robustness. That's why our handles are given the same attention to detail as every other component. Whether you choose premium stainless steel or colour coordinated ones, you can be assured of a contemporary handle which offers the same faultless service as the doors themselves. Choosing your Origin Bi-fold Doors has never been easier. Once you know your rough opening sizes or you're set on a particular number of doors and you are designing your opening around a configuration, we can help you fine tune your layout. Every door we manufacture is custom and manufactured to your exact sizes and chosen configuration. Your Origin Bi-fold Doors will keep you cool during the hot summer months. With a certified U-Value of 1.3*, it means that your energy bills will be significantly reduced as well as helping you stay green. Each bespoke Origin Bi-fold Door is designed and manufactured at our impressive state of the art UK facility. Only ultra-high quality components, specially designed by us, are used in an Origin Bi-fold Door. Every one of our skilled craftsmen takes pride in creating the best folding sliding doors money can buy. That's why Origin Bi-fold Doors are guaranteed by us to perform faultlessly for at least five years. Each bespoke door set comes with a unique serial number that guarantees the doors at the property for ten years. Origin Bi-fold Doors sweep away the boundaries between the inside and the outside of your home. Low threshold designs allow for equal floor finishes inside and out. There are two options available; weathered and non-weathered. Visually, the effect is stunning. Practically, it creates one space out of two for the ultimate use of your home. There are instances that a conventional door design is perfectly suitable but in the case that your room layout is slightly more unusual, we will have a configuration to suit your room – whether it be a corner set of doors at a 90 degree angle or even a bay set, your options on an Origin Bi-fold Door are virtually limitless. Turn a dark corner into a feature that floods your room with natural light to make even more of your living space. The aluminium frames of an Origin Door are all finished with a solvent-free polyester powder coating. The highly durable coating is manufactured by Interpon, who are the world leaders in architectural powder coatings. These natural-look finishes co-ordinate perfectly with existing wood or wood-effect windows and doors. The wood-effect powder coated finish has the look, texture and beauty of woods including Oak, Mahogany and Walnut, with all the advantages of aluminium. At Origin we pride ourselves on providing our customers future customers and installers with up to date important product information and updates. So, whether you’re still in the process of selecting your Bi-fold Doors or involved with the installation process, there’s information here to help you every step of the way.